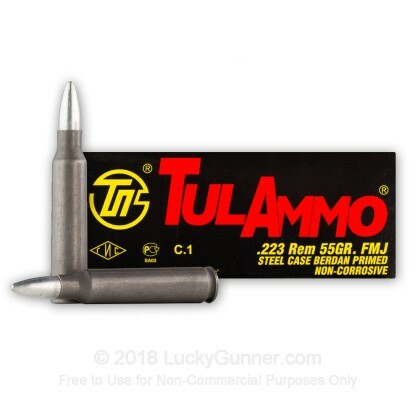 If you are looking for a great, reliable range training ammunition that won't cost a fortune, this 223 Remington ammo from Tula should suit your needs! These 1000 rounds of ammo should keep you busy practicing for a while. Each round has a 55 grain full metal jacket bullet that fires from bolt-action and semi-automatic rifles and carbines. Manufactured in Russia, these cartridges can withstand temperatures from -20 to +50 degrees Celsius (that's -4 to +122 degrees Fahrenheit). They contain Berdan primers and have steel casings and cannot be reloaded. If reloading isn't of interest to you, this is a great way to save a little money. 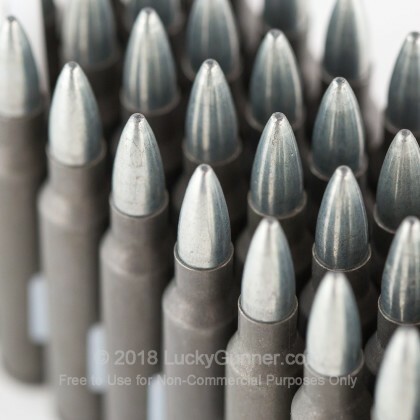 Berdan primed, steel cased cartridges are typically a bit cheaper than Boxer primed, brass cased cartridges which are generally reloadable. 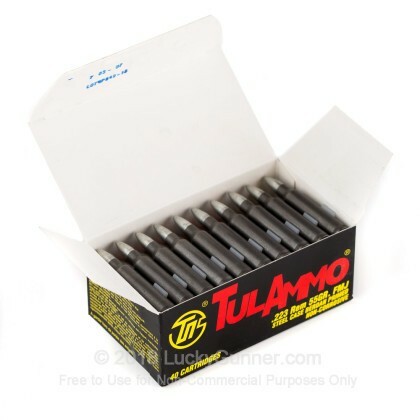 Tula ammunition is manufactured in Tula, Russia. Their products are marketed and sold under the brand TULAMMO all around the world. Their reliable, consistent performance and economical pricing are what makes TULAMMO so attractive. Order your 1000 rounds today and head to the range! I have put thousands of rounds down the pipes of my mk18. All tula. Keep the rifle wet. I clean it about every 2500 rounds. Never a problem. Good ammo for target shooting. Just ran 300 rounds of this ammo through my m&p 15 and it went good. Like others have commented it is a bit dirty but I clean my rifle often so it's not a problem. I haven't had any ftf or feed. I will be buying more. Tested this ammo in my rifle today, as I was curious why I've heard so many negative comments on it. I shot about 240 rounds through my AR15 (APF DMR .223wylde). The only issue I encountered was with my 30 round PMAG it jammed every 3 rounds until the last 10 or so. I tried my 40 round PMAG & had no issues. My rifle didn't care at all, it ate everything I fed it, no chamber jams beyond that 30rd mag issue. I was expecting a spent round not ejecting because of steel casing but that never happened. I'm pretty sure with keeping my rifle properly and well oiled during range time will insure good operation. I wouldn't use this ammo for more than target shooting though. Ran over a 1,000.rounds though rock river gun no problems. Very poor performance in a Colt AR. 8 jams and 3 no fires in the first 100 rounds. Spend a little more and get decent ammo. LG service and support is excellent - this ammo is not. Awesome ammo at an economical price!! I've shot Tulammo for about 10 years with no issues. My AR spits out every round every time. So far I've fired 500 rounds at various ranges from 25-100 yards. These rounds have not produced a single problem in my DPMS Oracle. Longer ranges had wider grouping, but as I'm new to AR shooting I blame it on operator error. I literally cannot find a better value in this caliber at any other website or brick and mortar store. Due to the casing you cannot hand load, but in a SHTF scenario that won't matter. Ran through 300 rounds with my Core 15 AR15 and had only a 2 jam and fail to eject. Very accurate and reliable. 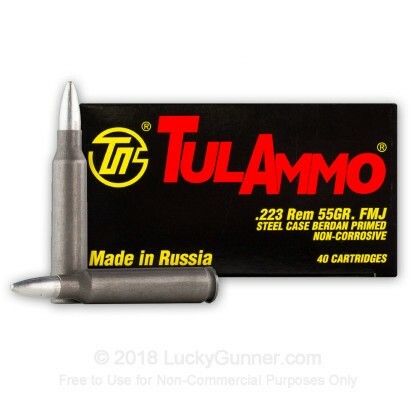 This ammo is worth buying. This ammo functions reliably and is reasonably accurate. The velocity was 3000 fps out of my 20" AR. I bought a case of this to split with a friend of mine. We each took 500 rounds and both of us have had no malfunctions what so ever. This ammo preforms great. I'm getting ready for another 1000! I have been very pleased with this product. 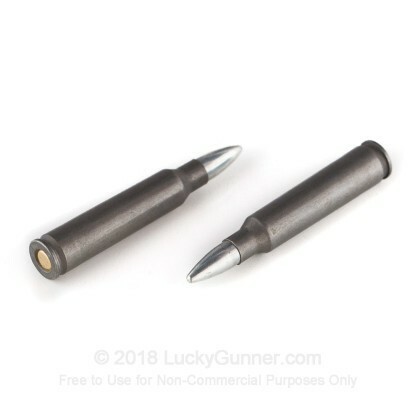 Ordered another case beats the over priced brass rounds for a day at the range. 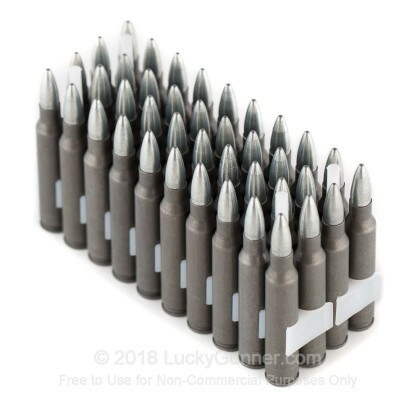 Q: Does this ammo have a steel core to it? Or is it copper over lead ? Thank you. A: The core of the projectile is lead, however the jacketing on the projectile is a bi-metal which contains steel and zinc/copper.